Oswego’s Pat Lavery earned career win No. 3 on Saturday night at the Oswego Speedway, winning the 50-lap Novelis supermodified event on the Port City’s fast five-eighth’s mile. The win was the second of the year for Lavery and fourth overall for Graham Racing this season. Lavery and his No. 12 racer would out duel co-front row starter, Dan Connors, Jr. on the opening lap and hold off a feisty Michael Muldoon en route to taking the checkered flag. After early evening exits by Kody Graham and Gene Lee Gibosn, 19 supermodifieds took the green flag to begin the night’s main event. Lavery and Connors would battle side-by-side for nearly a full lap until the eventual race winner was able to inch his way to the point. Connors, Muldoon, Keith Shampine and Brandon Bellinger filled out the top five behind the race leader at the close of the maiden lap. Otto Sitterly would best Bellinger on the outside on lap No. 2 to break into the top five. With Lavery beginning to pull away, Muldoon’s No. 15 shot under Connors in turn No. 3 to take over second place. Two laps later, Shampine would mirror the Muldoon move to take over third. One trip later, Connors would then watch Sitterly sail around his right side, bumping him back to fifth. With 14 laps in the books, a thankful Lavery would be promoted back to the top spot. He would lead Muldoon, Shampine, Sitterly and Michael Barnes. Connors, Bellinger, Jeff Abold, Dave Gruel and Bob Bond filled out the top 10. Lavery was solid on the restart, as the top five would begin the break away. Sixth-place running Connors would try to keep pace, but find himself spun-out in turn No. 1. Again, Lavery would have no challenge on the restart and the top five would quickly break away. With Lavery inching a few lengths out ahead of Muldoon, Abold would work his way under Bellinger for sixth on the 22nd lap. The caution flag would fall again on the 26th lap, after Hal LaTulip spun his No. 56 super coming out of turn No. 2. Muldoon would have another crack at Lavery on a restart, but to no avail. Just two laps into the green flag run, Aric Iosue’s No. 11 would suddenly shoot to the outside and pound the foam between turns three and four. Iosue would be okay, but the winning car just two weeks ago, suffered significant front-end damage. As he’d been all race, Lavery was solid on the ensuing restart. 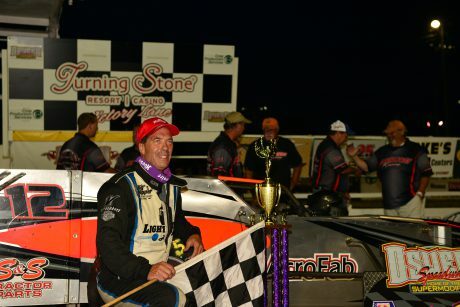 With 15 to go, he continued to hold a three-car advantage over Muldoon as the top seven cars had thinned out in front of the rest of the field. Coupled with a slight push in turn No. 1, light lapped traffic would present Lavery with a final challenge with just 10 trips to go. Again, Muldoon would close in behind him, but this time, Lavery would navigating his way around it. Muldoon would stay close the rest of the way, hoping to take advantage of Lavery’s push, but the No. 12 would not waiver. The supermodified veteran would hold on to finish atop the field and capture win No. 2 on the season. Shampine and his Chris Osetek-owned No. 55 would end up holding off Sitterly to earn a third-place podium finish. Sitterly would grab his fifth top-five finish, landing the John Nicotra-owned No. 7 in fourth place. Earning his sixth top-five finish, Barnes and his Syrell Racing No. 68 would end his night in fifth. A small, 16-car field took the green in the Pathfinder Bank small block 30-lap main. Jesse Bearup would lead the opening laps, but Dalton Doyle would better him with an inside move down the back straightaway on the sixth lap. Doyle would race away unchallenged, dominating the race for his second win this year. Michael Bruce would chase down and pass Bearup in lapped traffic. He would end up finishing in second place. Anthony Losurdo, David Cliff and Mike Bond provided for some exciting racing as they battled their way up through the field. Losurdo would end up getting around Bearup to claim third. Bearup would settle for fourth, just ahead of Cliff’s No. 50. Qualifying heat wins went to Michael Muldoon, Jeff Abold and Pat Lavery. Heat race wins were earned by Cameron Proud, Jesse Bearup and Jack Patrick.